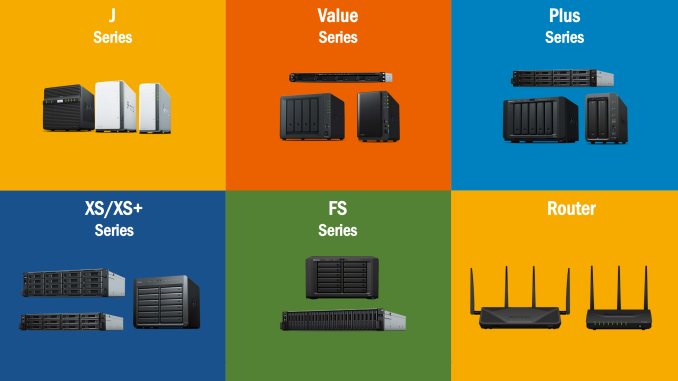 At AnandTech, we have been following the consumer and SMB NAS market very closely over the last decade. Synology is one of the leading vendors in this space. 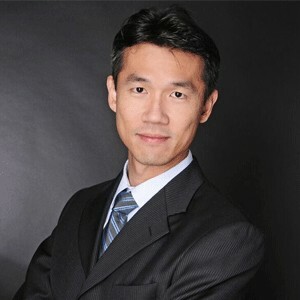 Similar to others in this market segment, they have also been attempting to grow both vertically by targeting the SME and enterprise space, as well as horizontally by creating products for the wireless routers market. 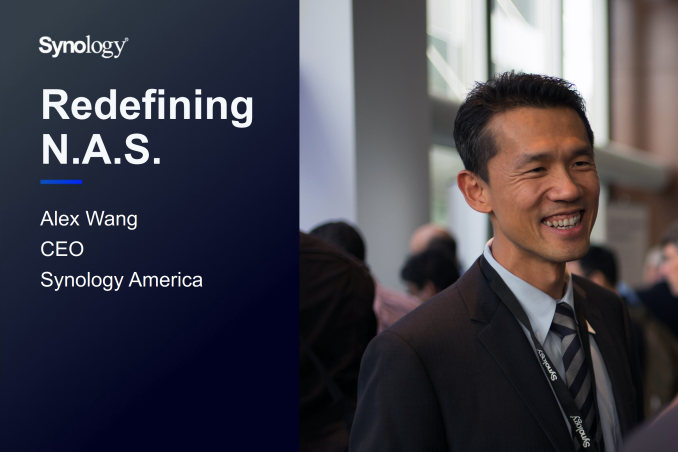 Recently we had the opportunity to sit down and discuss the state of the NAS market, as well as Synology's plans to address its requirements, with Alex Wang, the CEO of Synology America. Synology also gave us some insights into their product pipeline for the rest of the year. As the Senior Editor in charge of covering the NAS market, I have had the opportunity to field questions and comments about Synology products from a number of readers. Personally, I have always wondered about the limited hardware configurations available for the Synology NAS models compared to, say, offerings from QNAP. I have also recommended them to a few home consumers and SMBs, who have ended up being very satisfied with their purchase. On the other hand, I have also recommended some of their products for use in a SME setting, and the IT administrator who took up my suggestion (back in 2015) didn't have a great experience from a customer support perspective. Given these aspects, I had plenty of questions for Alex when I was pitched the opportunity to interview him. In addition I also wanted to discuss miscellaneous aspects such as security and privacy, along with Synology's expansion into allied markets such as wireless routers. Synology started out with the DS-101, a single-bay IDE enclosure with a 100 Mbps network port (targeting the home and SOHO market) back in 2004. Since then, they have expanded to multi-bay enclosures and rackmounts with high-speed network interfaces targeting SMBs and SMEs in addition to prosumers. In the recent years, they have launched all-flash arrays too. I had always wondered about the market segment that provides Synology with the highest return on investment, and Synology's internal estimated market share in those different niches. Would Synology's success in the SOHO / SMB space give it the impetus to challenge established enterprise vendors? I took this interview opportunity to find out Alex's thoughts on these aspects. Synology's primary challenge in moving higher up the value chain has been its after-sales support. Some efforts have been taken recently to address this issue, and the interview turned out to be a good opportunity to gather the specifics. Synology was one of the earliest CE device vendors to provide users with a cloud service to augment the core product features. Recently, the cloud has become a revenue driver for many vendors. Does Synology see any subscription-based cloud services as a significant growth area? How does Synology prioritize the features to implement in the DSM OS? The interview provided me with some answers. A common complaint that I have received from readers (and, also one of my own) regarding the Synology models is the absence of affordable non-Atom class NAS units (something available from vendors such as QNAP and Asustor). In addition, Synology also actively avoids experimentation, while vendors such as QNAP have no hesitation (eg. bring Thunderbolt-enabled NAS units, and affordable NAS units that can double up as direct-attached storage devices with an USB interface). The interview gave me the perfect opportunity to get Synology's reasoning behind the absence of such NAS devices. Without further digression, we move on to the transcription of our interview with Synology America's CEO, Alex Wang. We gave also had a peek at some of the upcoming Synology products and will conclude with our own thoughts on Synology's approach to the NAS and allied markets. Ganesh: We have different categories in the NAS market - home consumer, prosumers / power users, SMBs, and SMEs. Can you shed some light on what percentage of your revenue is from each of these categories? What are the rates of growth you have seen in these different segments in the last few years? Alex: First of all, the traditional definition of power users, SMBs and SMEs may not apply here as many businesses use small NAS in their environment while power users might have rack servers in their home labs. It’s difficult to say how different types of products are distributed among these segments since we can’t be certain of the usage scenarios. However, let’s assume 8-bay desktop NAS and below are for power users and devices with more bays or rack servers are for SMBs and SMEs. The business segment accounts for 40% of our revenue in the U.S., but is 27% if calculated worldwide. In terms of growth, business NAS numbers have seen an average of 20% increase for the past five years, while the growth of the power user NAS segment was relatively slower. However, home NAS has been catching up with 15-20% growth since 2017, which largely results from the rise of privacy concerns and people wanting to own their data and build a private cloud. Another market I would like to highlight is video surveillance. According to our statistics, 10% of the NAS in the wild are paired with security cameras. And the annual growth rate of our surveillance license sales is 40% over the past five years. The strong demand of physical security will continue to drive the growth. Ganesh: What is Synology's internal estimated market share in the various NAS market segments? Who do you treat as primary competitors? Alex: First, let’s talk about the storage market. How big is the market and which segment Synology is in? We share the “traditional” power user NAS market with a lot vendors, such as Buffalo, Netgear, QNAP, and WD, in which we take approximately 40-50% of the market. From a completely different perspective, Synology probably only accounts for less than 1% of the market share if you consider public cloud storage providers as our competitor. However, public cloud storage and NAS are not necessarily substitutes for each other, but rather should be considered complementary and can work together to build a seamless storage solution. The NAS market for business is more complicated, because the ways that NAS is used vary from one organization to another. Some use NAS for backup, while others might use them for tier-1 application storage or virtualization storage. Storage vendors with such capabilities include EMC, NetApp, HP, etc. There are all-flash array vendors like PureStorage and Nimble Storage, and those with hyper-converged solutions like Nutanix, etc. 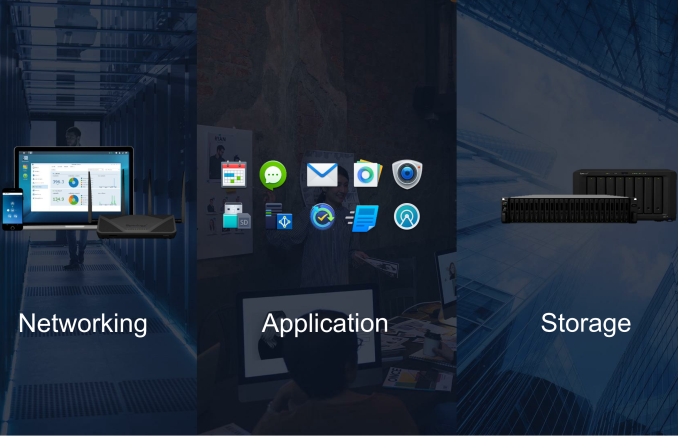 Synology NAS can be used in all the above scenarios, as virtualization storage, a hyper converged application server, or as a backup server for various business workloads. Since this market is huge, I estimate we take less than 1% market share. Ganesh: Within the SMB / SME market, do you see customers migrating from NetApp and other premium filers to Synology units? Is that a market segment where Synology can provide a credible alternative? Alex: For sure! 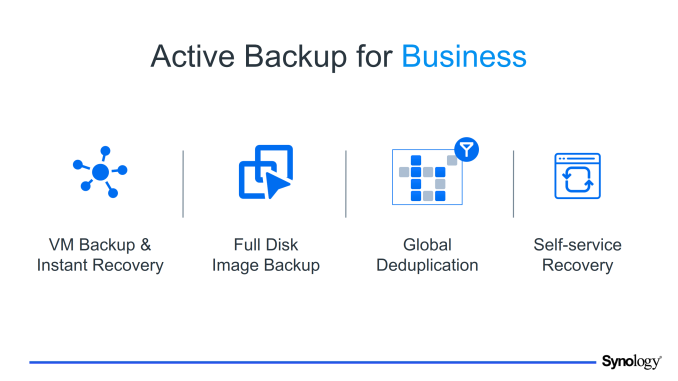 We are seeing many SMB/SME users moving from traditional storage vendors to Synology solutions, which are more affordable and user-friendly, provide more functionality, and allow people to do more with their data. There are more than 5 million devices deployed worldwide since we released out first NAS in 2004. A user base of that size is huge compared to other business storage vendors, which means there are millions of people using Synology NAS in a range of environments, so we can identify and fix problems faster than others. Also, we have two major DSM releases every year, along with timely security updates. Fast response to vulnerabilities and software quality are what set Synology apart. Ganesh: One of the main issues raised by some SME IT administrators deploying Synology NAS units is the after-sales support infrastructure. Online tickets that get responded to in a slow manner, non-availability of replacement hardware in a timely manner etc. while home consumers can bear some delay in these types of situations, mission-critical businesses can't. How does Synology hope to win back the trust of such IT administrators? Would working with VARs help take care of this lucrative market segment? Alex: We understand that after-sales support is very important to both home and business users. As a matter of fact, we are undertaking quite a few changes to better the service for the North American market. Besides doubling the manpower in the West Coast support team, we set up an East Coast office near Washington D.C., allowing us to offer free phone and chat support from 4am - 9pm PST. However, it is hard to troubleshoot over the phone for complicated issues. We highly suggest customers to submit a support ticket online. Usually our response time is within 24 hours, including weekends. Most of the users receive a response within a few hours. For example, 30% of the tickets received responses within four hours in April. Additionally, we have high-priority support for our reseller partners or users with high end models, such as XS/XS+/FS products. These users usually receive several responses during the day, which is not bad compared with other paid support offerings. For hardware issues, we do offer options for expedited hardware replacement. Instead of paying for SLA, you only pay when necessary. For high end models, such as 2U rack servers, we offer a free next business day replacement, which is called SRS (Synology Replacement Service). Some VARs recommend business users set up a high availability cluster, which is the easiest way to double the reliability by having a passive server take over when the active server experiences issues. The cost to build a high availability cluster with Synology is very competitive, and it gives VARs more time to help customers fix the problem with minimum downtime. We understand that support can always be enhanced and are constantly thinking of ways to improve our support service. With that in mind, I’m glad to announce that 24/7 customer support is in our plan and will be available in the near future. Ganesh: Many CE appliance vendors are moving towards a services model with a cloud backend as a driver for revenue growth. Does Synology have any plans for subscription-based value additions to their product range? Does Synology plan to create any fully cloud-reliant products in the future? (eg. : The Google OnHub wireless router doesn't work without an active Internet connection). Alex: Technology changes fast. Vendors are constantly on the lookout for new opportunities. We are always open to adapt new concept, such as cloud-reliant products, as long as it make sense. The same for business model; it doesn’t matter if it is subscription-based or not, we are all for it as long as the product or service can provide value to our users. Our product development has always been driven by the mission to “bring extra value to the customer.” Synology announced several products recently besides NAS. We started to provide the Synology C2 Backup service worldwide, which allows users to subscribe and back up their NAS to Synology’s own cloud storage. We introduced applications like MailPlus – a private cloud mail server--and Active Backup – for business to back up their PCs, virtual machines, or public cloud workloads to a centralized location. We also introduced a license model for advanced business applications to help people avoid additional costs if the service is not relevant to their workflow, while other users can enjoy high quality applications at a reasonable cost. Ganesh: Moving on to NAS-specific topics - can you give some background on how Synology prioritizes features to implement in DSM? Is it based on direct user feedback, or, do you have marketing folks talk to your high volume customers? What do you think is the best new feature (or, feature that has received the most favorable feedback from users) that has been introduced in DSM in the last 3 years - in the home user and SMB / SME space? Alex: Our product feature ideas mainly come from 3 sources – direct customer feedback, channel feedback from reseller/media partners, and Synology internal team. Direct customer feedback is very important for us. Our CEO and management team used to review every single support ticket and make sure to address the reported issues and feature requests. Even now, we still have a way for management to review direct feedback from our users and take it into account when making plans for product development. However, it is up us to make the final decision on how to deliver the best solution for our customers, since feedback might be contradictory from different sources. For example, business users wanted us to remove Download Station while home users love it. We made it into a package to satisfy both segments in the end. Some features might be requested by a lot users, but we decided to go in a different direction after careful evaluation. Most importantly, we always make sure to delivery extra value to users when adding new features to our NAS. We had four major DSM releases in the past three years, DSM 5.2, 6.0, 6.1, and 6.2, which introduced tons of improvements and new features, such as Synology Drive, Office, Moments, Active Directory Server, Hyper Backup, etc. Personally, I think the most important and useful feature for all segments is snapshots, which makes it extremely easy to restore files and protect users from ransomware. Ganesh: Synology is one of the very few vendors to support both ext4 and btrfs for the NAS volumes. Does Synology have some insight on btrfs adoption in its customer base? To be more specific - amongst your customers with NAS units that support both, what percentage are going for btrfs over ext4? On the same technical topic - does Synology have plans for SME NAS units that support ZFS in its roadmap? Alex: We recruited lots of engineers on filesystem development when started our business in 2000 and were using UFS, ReiserFS, EXT2, EXT3, and EXT4 back then. Adapting to a new filesystem is a significant decision to make. We had a very comprehensive testing plan for different scenarios and spent two years tuning and making sure it has production quality on performance and reliability before finally deciding to move to Btrfs, which also comes with great features such as snapshots, checksum, and group quota, and more. Right now, we have Btrfs on all x86 and 64bits ARM platform models. More than 90% of users choose Btrfs during new NAS installation according to our observations. ZFS was on our list but given up for several reasons. First and the most important, reliability. ZFS on Linux is very new. The most important layers of ZFS source code are “re-implemented” on Linux because of license issues. Second, performance. ZFS requires more memory and the performance is not better than Btrfs in compact NAS servers. I’d say both ZFS and Btrfs provide great feature sets, but the latter fits better with our solutions. Limited Hardware Choices - A Valid Complaint? Ganesh: Many of our readers feel that Synology is behind the curve when it comes to adopting new technology - NBASE-T / affordable 10GBASE-T is a recent example that comes to mind. I remember getting a lot of reader feedback regarding Synology introducing 'new' NAS units with the old Rangeley Atom platform when other vendors in the market had moved on to Denverton and Apollo Lake-based products. How does Synology plan to address that mindset in the market? Alex: We understand the love for new CPUs and more hardware options and are constantly looking for new ideas. We actually work closely with CPU vendors, who usually send us new CPUs at very early stage and seek our help to develop sample designs for motherboards. There are several factors affecting which CPU to use in the end, such as cost, performance, maturity, or whether it fits into our current portfolio. We won’t release a new product that performs the same as its predecessor does with a higher price tag just to say it has a newer CPU. We still have quite a few stages to go after deciding on a new platform, from design review, sample run, pilot run, to full software testing, disk compatibility test, thermal test, mass I/O stress, and many other reliability tests. The comprehensive testing process is the main reason why new CPUs are adopted later. 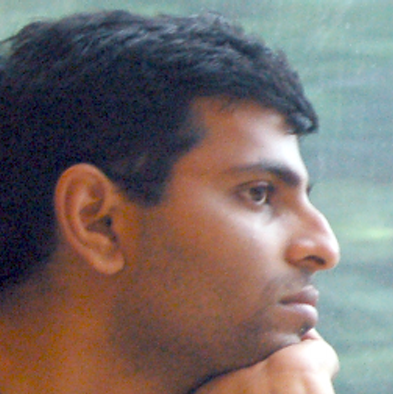 Ganesh: What is the reason for the limited hardware choices for home users / SMBs when compared to, say, QNAP? Some background: Based on reader feedback, as well as my own experience, the 'NAS as a VM host' feature is one of the most interesting features to have come out in the prosumer / SMB market - and QNAP was, if I remember right, one of the first vendors to introduce it. Other vendors, including Synology, have come out with similar applications, but, the hardware side has been lacking. To make effective use of this feature, we need NAS models with more RAM, dedicated NICs, and powerful CPUs. I am happy to see that the recent DS1618+ addressed some of these - we have upgradable RAM and quad-NICs, but, the CPU is still Atom-class. Why doesn't Synology have models with Core i3-/ i5- / i7- or even the multi-core AMD Ryzen CPUs in a form factor similar to the DS1618+? Alex: We try to find the balance between cost and performance when choosing CPU. Performance-wise, CPUs like Denverton or Avonton are very powerful for prosumer and SMBs considering the limitation of network bandwidth. Even for heavy applications like running a mail server, web server and multiple user synchronization, Denverton CPU is definitely powerful enough to handle those tasks easily. We would like our users to get the most performance out of the product without breaking the bank. I also agree that several applications, such as “NAS as VM Host” can use some extra computing power and more memory. For example, Atom CPU is capable to run virtual machines. But it’s better to use higher end CPUs if the applications in the virtual machine need more computing power. However, if the cost of the NAS would be $500 more in order to run one or two VMs, why not buy a mini PC? So we think about it differently. First, why would you use NAS as a VM host and who needs it? For prosumers, running VMs directly on NAS is for lightweight usage because of the cost of high-end CPUs and RAM. Businesses would be more serious virtualization users, and they’d probably prefer Xeon CPUs and run more heavy duty VMs in their production environments. Therefore, we decided to include features like VM high-availability design, VM clustering, and live migration without service interruption when implementing our own VM host. We also integrated virtual machine hosting with our backup solution to let users power on the VMware or PC server backup directly on the NAS. Making decisions on those platform and CPU selection is not easy. I believe our sound feedback channels will lead us to the right direction. Alex: We don’t really see the benefit now as the performance of Thunderbolt DAS is no better with 10GbE NAS while the price is much higher. You can actually buy a Xeon CPU NAS at the same cost. However, we will watch the market closely and take it into consideration if the cost/performance ratio for Thunderbolt is good for our users. Ganesh: Security and privacy are becoming more important in an era of increasingly connected devices - Can you share some thoughts in relation to how Synology is tackling these aspects? Particularly on the privacy aspect - what did Synology have to do for GDPR compliance? On the security front - how far back does Synology's updates go for updates to vulnerabilities like Spectre / Meltdown that have microcode patches from Intel? Alex: Concerns about data security and privacy are the reasons why people start seeking ways to build their own cloud and find Synology. These two subjects are part of our core values. In order to cope with GDPR, we conducted a third-party audit and revamped parts of our internal systems, such as the Synology Account site, customer support system, and event registration, which was a nightmare for our IT team but they survived. I think our stance on data security is self-explanatory if you own a Synology NAS. Users might notice that new software updates are extremely frequent to add new features or address security issues. At Synology, we react on security issues quickly thanks to our department called PSIRT (Product Security Incident Response Team). Security issues are usually addressed in a few days depending on the severity. Additionally, Synology is part of Common Vulnerabilities and Exposures (CVE) Numbering Authority, meaning we can assign our own CVE numbers. Based on our evaluation, the impact of Spectre and Meltdown to our systems is minimum if you are not running Docker, personal Web Station, or Virtual Machine Manager. However, we are work with relevant vendors to address these issues. Knowing the fix for this issue is very complicated, we are running additional tests to be cautious. I believe the patch would be ready soon. Alex: The data storage market was very mature when we introduced our first NAS. Especially for the business segment, technology like Tape Backup had existed for decades but then the market transitioned to large capacity hard drives and tape backup became less popular. Nowadays, cloud plays an important role in the storage market. Mature markets can be disrupted by new technology. When entering the market for home data storage, Synology was not the first vendor offering compact NAS solutions. But we were the first to bring high end features to the entry-level market by adding a portfolio of interesting applications and introducing a new user interface for easy data management, which have become standard features for a consumer NAS now. Same for the router market. The way people use Wi-Fi routers wasn’t much different from 10 years ago. But we can feel the market is changing slowly. We believe with our networking and software expertise, we can bring new excitement to the router market. We developed our expertise and released RT1900ac and RT2600ac after integrating Wi Fi and router features in our DS213air back in 2013. These products soon received a tremendous amount of positive feedback. This is just a start, however, more innovations have yet to come. Ganesh: To wrap things up, can you provide us a high level overview of where Synology is headed, and share roadmaps on what consumers can expect in its different product lines? Alex: On the software side, you could expect DSM 7.0 to come out later this year, which would continue the concept of Synology as a hyper converged server and let users do more with their data. On the hardware side, we just launched our first 6-bay Plus series NAS DS1618+. You can expect products in new categories, such as a 6-bay Slim series, 8-bay rack server, and 4-bay XS+ series later this year. As 10GbE demand increases, you can see our 10 G Base-T solution coming out soon as well. 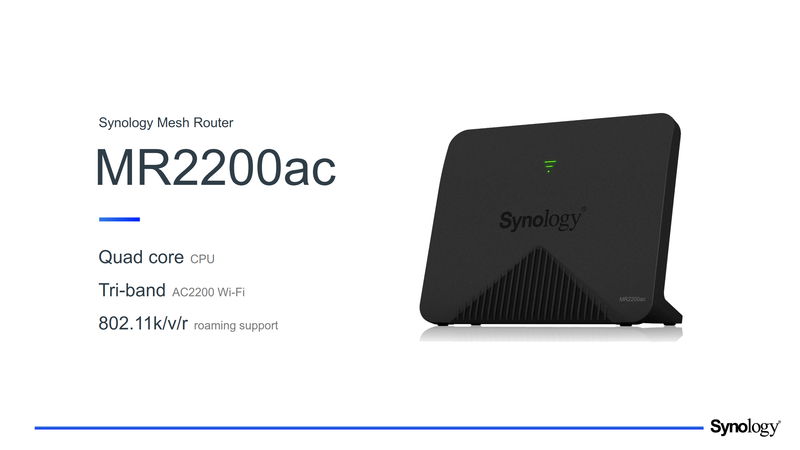 For networking, a brand-new Synology Mesh Router system will be launched this year with advanced Safe Access apps for parental control, content filtering, and threat detection. Like what was done for NAS, we are bringing high end business features into consumer routers. With more and more applications being added into the Synology ecosystem, it’s more of a powerful hyper converged server than merely a storage device. We always make it our mission to go beyond data storage, bring data to life for users to collaborate and accomplish more. Synology has evolved into a respected vendor of SOHO / SMB NAS equipment over the last decade. They have been attempting to get a foothold in the SME space, and as expected, they have faced some growth pains. That said, the evolution of various DSM features, along with the improvement in customer support, is bound to help Synology in the enterprise market segment. The opportunity for subscription-based value additions is likely to boost revenue prospects. On the home consumer side, the private cloud aspect, coupled with some of the newerl deep-learning based applications inside DSM, are differentiators in favor of Synology. As a power user, I would say I am more impressed with the breadth and depth of the portfolio of a vendor like QNAP on the hardware front. Synology opts for a more prosaic approach, with a limited number of models to target as wide a market as possible. The DSM features and applications are also getting well-delineated based on the target market. It does seem to be working out well for them from a business perspective. On the wireless routers side, Synology is still in the follower mode compared to established vendors like Netgear, Linksys etc. That said, the SRM (Synology Router Manager) OS brings in a router management and usage UX that is currently unmatched in the market. Whether that helps Synology gain a foothold remains to be seen. It is early days yet on the Wi-Fi side. The challenge for Synology (and other NAS vendors too) on the home consumer side is to convince users of the need for a centrally accessible local storage in the network. With cloud backups for photos and videos becoming ubiquitous, one of the primary reasons for home consumers to get a NAS is out of the picture. Based on my interactions with Synology, it does appear that consumers are slowly seeing the benefits of the private cloud. Our hope is that more users see the light and don't trust the cloud as the only repository for their content. Synology states that the days of NAS as just 'network attached storage' are numbered. With their product portfolio, they want to define it as 'Networking, Applications, and Storage'. That, in our opinion, is a nifty tag-line to describe Synology's efforts over the last couple of years. I recently looked at Synology options for a friend and I was quite disapointed. I used their product comparison system and only 2 of them supported 4k transcoding, both having low drive counts. Who is going to drop $700 US or more on a larger enthusiast system (5-8 disks) and not want 4k future proofing? Then there's the 2.5/5 and 10Gb networking options, not much there either. I recall when I thought Synology wiped the floor with QNAP but some of the later product offerings are pretty competitive. Expensive but they do offer them for that home enthusiast with the dollars. I also like the idea of giving AMD some money, be it a lightweight Ryzen, or even Epyc 3000 system. Running VMs docker, etc - this is all potentially viable with a half decent system. Sure you can't run 6 VMs on a 16GByte NAS and ensure it runs great but the option to run a few of them for the advanced home tinkerer is wonderful. At the end of the day, 4 years ago I decided to opt for a FreeNAS machine on an AMD Microserver platform and I'm very happy with it. Fast forward to now, I think I'll have a little peek at Synology and things have improved but still not where I would consider moving there. Very few options on the Denverton range, why not offer an 8 or even 12 core which can ensure 4k transcoding? It seems they offer very few with the Denverton processor and what they have is 4 core, no more. Both of you are incorrect OR Synology own website is terrible. 4 bays maximum if you want 4k transcoding?